Kale Chips: Which Oil Works Best? If you aren't aware of it.. Kale Chips have become all the rage. You know when Martha is doing them, everyone is doing them. 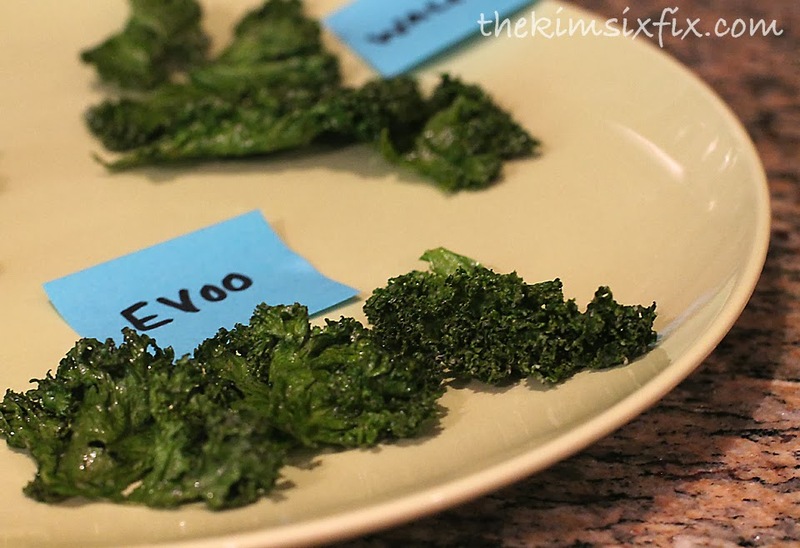 Basically, they are oven dried pieces of Kale, which become cripsy. To say they are similar to fried potato chips would be a stretch. They are more like dried seaweed snacks but they will satisfy the salty/crunchy craving. 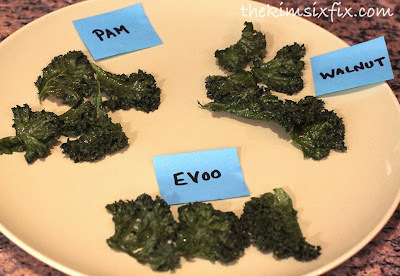 And since everyone is making Kale Chips, it is hard to nail down the 'best' recipe. There are so many variations.. different baking times, temperatures and seasonings. Since the standard "plain" recipe is kale, salt and oil, I decided I would do a side-by-side comparison of different cooking oils to see which came out the best. To make it a fair test, I cooked all the chips on the same baking sheet, with a tiny pinch of salt and no other flavoring. I settled on an oven temperature of 300 degrees for approximately 15 minutes, since the chips would be dry and crispy without any browning/toasting. I used curly organic kale torn into pieces no larger than 3 inches across and used 2 tsp of oil for each batch (and a quick spray of the Pam). The results were rather surprising. All the chips came out well, but there were distinct differences between the oil types and pros and cons for all of them. In conclusion, for my personal taste I would go with Walnut Oil. I liked the nuttier flavor and health benefits. 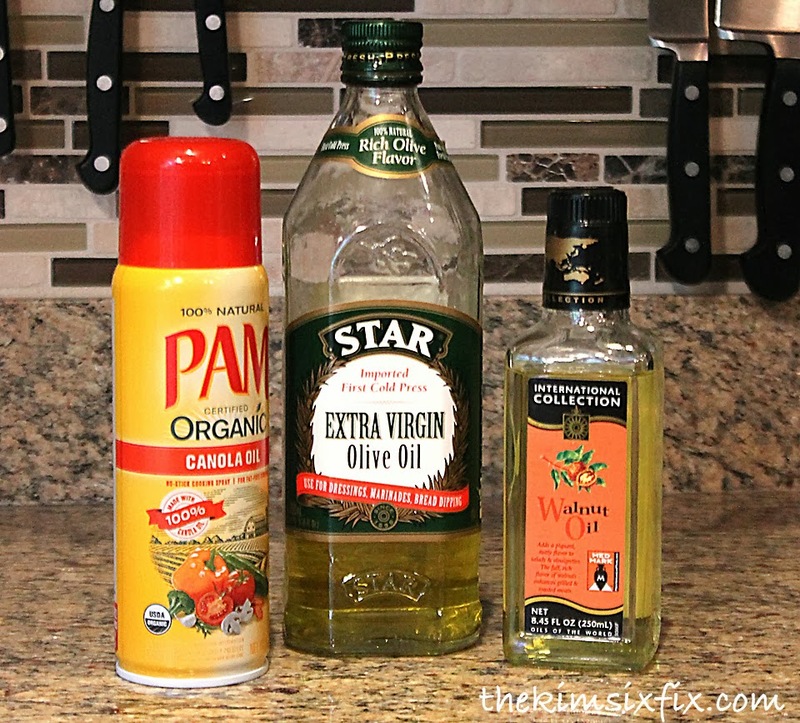 For a quick and easy chip, with a lot less fat or calories, the Pam was a good alternative. And if you would rather use 'real' olive oil, the EVOO is the best way to get a clean Kale flavor. There is a also a superior oil I found about from The Hampton's Diet (by Dr. Fred Pescatore). Not only does it offer superior health benefits, it is the most delicious oil I have ever tasted. It has no overpowering or distinct flavor. It's Australian Macadamia Nut Oil from Mac-Nut-Oil.com. I have used it for some time now, and I can attest to its health benefits in weight loss and flavor. Check it out! It also has a very high smoke point (400 deg. F). Can't wait to try it with the kale. Thanks for this post. Thanks for this post! I've made kale chips to no avail. I'll be trying it again, tho!